It's about a girl, Emery who wants to be like any other girl - to go to school, hang out with her friends, and just be normal. But, as long as she remembers, she's suffered from seizures. But, these "loops" when she travels back and froth through time consume her life. There are others that are interested in these loops, but Emery is fading physically. When she escapes to the town of her loops, she meets Ash who must help her unravel their complicated connection before it's too late! THE BOGO Bookfair will be at Laraway School April 28 - May 3. This means that you can buy one book and get one book (the same or lesser value) for FREE!!! THIS IS A GREAT TIME TO STOCK UP ON BOOKS FOR SUMMER READING! THERE WILL BE NEW BLUESTEM AND CAUDILL BOOKS AVAILABLE! Our next Family Literacy Night is for our 3rd - 5th grade students, entitled Poetry Cafe'. Students in 3rd - 5th grade and their parents will enjoy coffee, pastries, prizes, and poetry throughout the evening. Younger siblings will have childcare provided. Visit this site designed just for YOU to research easier! Just type in pathfinder in the green box. Reader's Cafe' will be meeting the week of March 18th. 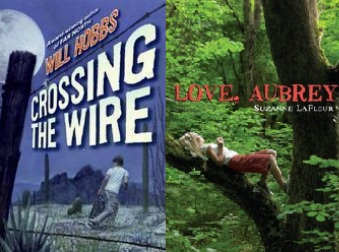 Boys are reading Crossing the Wire and girls are reading Love, Aubrey.